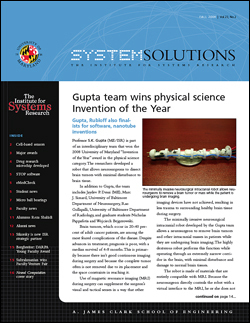 The fall 2008 issue of ISR's newsletter, System Solutions, is available to view or download in PDF format. Articles include new research on cell-based sensors, a microchip for drug research, software that mines the opinions on social networking sites on the Internet, and software that can help public health workers dispense emergency antibiotics. The newsletter also covers a major advance in micro ball bearing technology for miniature machines and includes a feature story on alumnus Reza Shahidi and his career in the wireless communications industry.